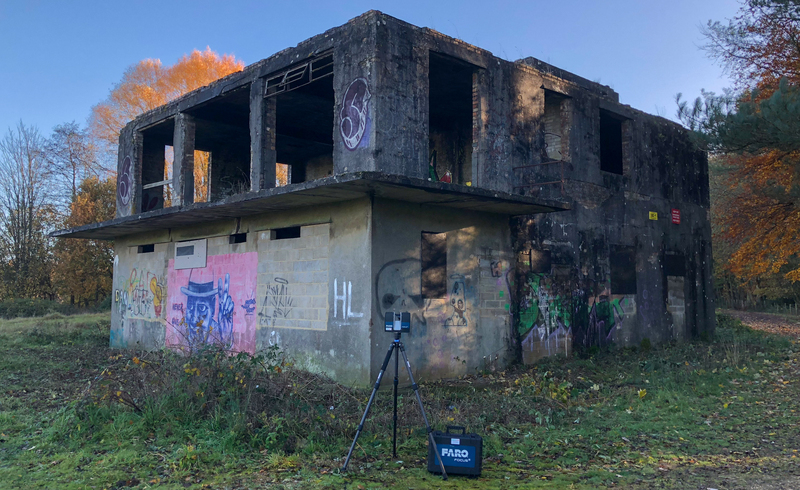 In November 2018, Archaeovision member Gianna Gandossi conducted a laser scan survey of the World War II-era RAF Ibsley Airfield Control Tower located outside of Ringwood, New Forest, Hampshire. 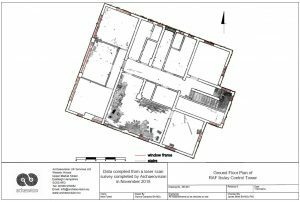 The recording completed by Archaeovision falls under the Heritage Lottery funded Our Past, Our Future project which incorporates community based outreach within their Rediscovering and Conserving Our Archaeological Heritage sub-project. Construction of an airfield at Ibsley began in 1940 at the early stages of World War II and was officially opened in February 1941. Soon after, Ibsley was chosen as a filming location for some of the action scenes in the wartime classic propaganda film, ‘First of the Few.’ As a busy RAF (Royal Air Force) and USAF (United States Air Force) fighter base, it was home to Hurricanes, Spitfires, Whirlwinds, Mustangs and Typhoons of 26 RAF and USAF squadrons. Units from the airfield flew operational missions over France, acted as Flying Instructors and Transport Command Glider Pick-Up Trainers, among many other missions. The airfield was placed on “Care and Maintenance” in October 1945 until its final closure in 1946. The airfield was later used as a race circuit managed by Ringwood Motor Cycle and Light Car Club until 1955. The area then became a key quarrying area in supplying the county with gravel and now presents itself pleasantly as a series of landscaped lakes. 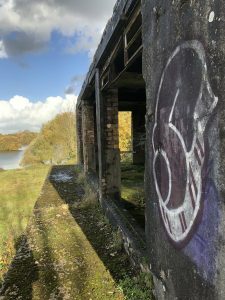 The Hampshire and Isle of Wight Wildlife Trust manages the site today and two local organisations, the RAF Ibsley Historical Group and the RAF Ibsley Airfield Heritage Trust, exist to further interest in the old airfield. A wealth of information can be found at the Atlantikwall website, including historical maps and photographs, and a flight simulator has been created, screenshots of which can be found here. 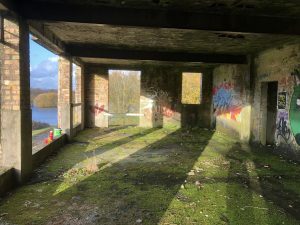 The design of the control tower itself (a type 518/40 ‘Watch Office with Meteorological Section’) is similar to some 50 other towers that were built during the rapid expansion of airfields by the Air Ministry before and during World War II. However, this one is believed to be the only example in the country whose floors and balcony were formed entirely of concrete and has survives unaltered since its construction. 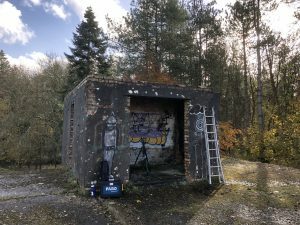 The purpose of the laser scan recording is to document the current state of the building, not only to act as a preservation tool, but to assist engineers and architects in the structural maintenance of the control tower in the following years, as well providing a basis to enable the building to be Grade listed. 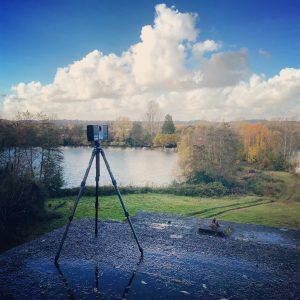 To create a detailed record of the state of the control tower, laser scanning was used via a Faro Focus x150 to capture both the exterior and interior features of the control tower. 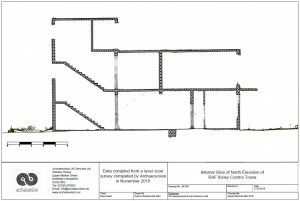 This incorporated over 100 individual scan positions. 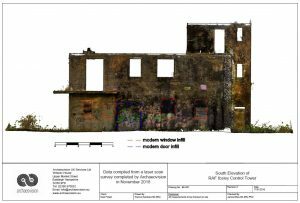 The resulting 3D model is used to created very accurate CAD drawings of the current state of the building, which you can see a sample of in the images below. The following video is an animation of the 3D model.